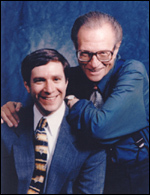 World renowned CNN talk show host Larry King, and his spiritual advisor, Irwin Katsof, have written Powerful Prayers - a fascinating and inspirational book. In it they ask some of the world's most prominent, glamorous, and intriguing figures of all denominations to answer the most profound questions of our times, questions that deal with the resurgence of faith and spirituality today. Recent surveys indicate 50 percent of all Americans pray at least once a day, and nine out of 10 people in the nation’s largest and most unconventional city, New York, believe in God. The popularity of religious-oriented books and radio and television programs underscores his renewed interest in spirituality. In the book, King and Katsof explore the intimate prayers of President Jimmy Carter, Prime Minister Shimon Peres, Lady Margaret Thatcher, the Dalai Lama, Kirk Douglas, Christopher Reeve, Noah Wyle, Kareem Abdul-Jabbar, Tommy Lasorda, Lou Holtz, Scott Hamilton, Alexander Haig, Senator John McCain, Rabbi Marvin Hier, Reverend Jerry Falwell, Alan Dershowitz, Pete Seeger, Tony Robbins, Dr. Laura Schlesinger and many others. For IrwinKatsof the subject was a natural. His fresh, soft-spoken approach has attracted many entertainment and business leaders to explore their Jewish roots. The upshot: How to Get Your Prayers Answered, which hit store shelves in February 2000. Drawing on the Bible and ancient texts of Jewish wisdom including the Talmud and Kaballah, Irwin Katsof has produced a user-friendly, five-step guide on communicating with the Almighty. "Words Can Heal is a national campaign to eliminate verbal violence, curb gossip and promote the healing power of words to enhance relationships at every level." Much of the Words Can Heal Handbook centers on specific tips and tools to help the reader succeed in their goal of using words to heal. The book is also filled with poignant stories of how words can hurt or heal. Each story offers helpful insights into the importance of improving our language. "Thank you for reminding me of the power of the spoken word -- with the Devil here on my shoulder, I need all the help I can get!" "We may have the right to gossip under the First Amendment, but Words Can Heal shows us that exercising this right is wrong - and inconsistent with the spirit of the Ninth Commandment: 'You shall not bear false witness.'" "Every CEO must read this book. You cannot run a company with your greatest assets stabbing each other in the back." "Gossip -- we've all done it! Read this book and find out why it's so important not to. It will help you in all your relationships." "This is a great project." "I salute you for your good work! If 'WordsCanHeal' saturated the high schools of our country, we wouldn't see the shootings as we do." "This book is a great reminder that integrity is your greatest asset. It offers practical instructions on how to build trust in your business and personal relationships." Greg Brenneman, Former President & COO, Continental Airlines, Inc.
"An important guide on how to have healthy, uplifting relationships. This book inspires the reader to live and communicate with courage and integrity." "Just what this country needs! If we could measure the damage to corporations from gossip, it might be more than the GNP of the Third World!" "'Words Can Heal.org' What a great concept! When combined with 'The Words Can Heal Handbook,' here is a campaign that has the potential for positive, life-affirming change in our society and our world."